If you are like most couples today, your wedding budget is (at least) a bit tight. 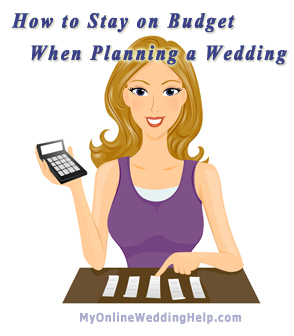 The good news is when you have a plan, it’s so much easier to stay on budget when planning your wedding. Know what you can spend in each area, then keeping track of how much money you have committed and how much you have left. Think of your wedding as any other large purchase: you want to keep the cost at or below a certain number. The obvious first step is knowing that number. Before you begin planning, have discussions with everyone who may be contributing to your wedding costs. Most likely this will be your parents, future in-laws, and you and your fiancée. – Wedding planning tools such as a wedding planning checklist and wedding budget planner. – Wedding stationery, which includes invitations and related inserts, programs, and save the date cards. – Both the bride’s and groom’s rings. – Bride and groom’s ensembles (in other words, what you will each wear, including jewelry and accessories)–wedding gowns, veils, other headpieces, her shoes, his shoes. – Reception and ceremony expenses, including related rentals. – Photographs and video, including both the professionals’ time and cost to buy the finished products. – Wedding party gifts for bridesmaids, groomsmen, parents, and others who participate in the wedding. – Transportation such as a limousine or rides from and to the airport. The rehearsal dinner and honeymoon are generally budgeted separately from the other expenses. The rings are often looked at as separate expenses as well. When you have the total amount decided you are ready to break out your budget by category. Your best approach is to use an interactive budgeting sheet to split your dollars into categories. (I have a free one for you here). Reception and ceremony expenses. 50-60%. Now that you know how much you can spend on each category, the next key is limiting spending to those amounts. Knowing what you have already spent (or committed to spend) is critical to staying within your budget. As you order, buy, or commit to contracts, keep a running list of both those expenses and what this leaves you with. What if it looks as if you cannot stay within your budget? This is where your creativity comes in. – Keep your guest count low. Many of your reception expenses are determined by the number of people attending. – Have the wedding on a lower-demand weeknight or Sunday. Rental rates can be much lower. – Prioritize what’s important to you; scrimp on what is not. Why spend a lot of money on something you don’t care about? – Do-it-yourself (DIY) as much as possible. But factor in your time and expertise as well. Sometimes buying is actually better for your overall spending (or sanity). – Shop online for lower prices. Your local Dollar Store, IKEA, or warehouse club may have the best deals. But selection can be lacking. Getting what you want at the best price almost will likely require some online shopping. Whatever your approach to staying within budget, remember sharing your big day with family and friends is what really counts. So don’t sweat the small stuff!